The Lehigh Valley IronPigs defeated the Rochester Red Wings 13-6 Thursday night at Frontier Field, in the 2019 home opener. The teams meet again Friday night at 6:05 p.m. The IronPigs got off to a quick start as three men crossed the plate in the top of the first against Red Wings starter Lewis Thorpe. Dylan Cozens hit an RBI triple after Phil Gosselin singled. Mitch Walding and Rob Brantley each added in an RBI single before the inning was over. Shane Robinson's RBI single off Thorpe drove in another run in the fourth inning, for a 4-0 Lehigh Valley lead. Rochester finally got to Pigs' starter Jerad Eickhoff, in the bottom of the fourth Ronald Torreyes led the inning off with double, followed by a walk to LaMonte Wade Jr. In the next at bat, Luke Raley crushed his first Triple-A home run over the right field wall, to bring the Wings within one run at 4-3. Lehigh Valley extended their lead, and chased Thorpe, from the game in the top of the fifth. Ryan Eades came on in relief with two men on base, and the Pigs tacked on three more runs, two charged to Thorpe, for a 7-3 lead. 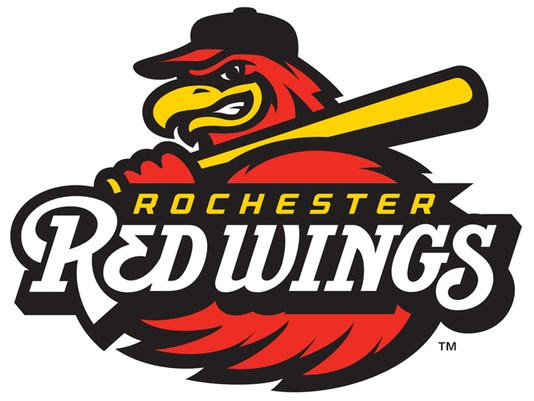 The Wings' starter worked 4.2 innings, giving up seven hits and six earned runs. Thorpe walked five, struck out five, and threw 92 pitches - 54 for strikes. Tomas Telis responded quickly in the bottom of the fifth with a leadoff single. He went to third on a double by John Andreoli, and scored on a ball hit by Torreyes that was mishandled by Eickhoff. The run made the score 7-4 IronPigs. Eickhoff pitched 5.0 innings, allowing five hits, four runs (three earned) with a walk and six strikeouts. Eickhoff threw 83 pitches, 54 for strikes. After Eades was able to fire a scoreless sixth, the Wings were able to tack on another run. Wilin Rosario hit a leadoff single, followed by a double off the bat of Brent Rooker to put runners on second and third. Jordany Valdespin grounded out, allowing Rosario to come in from third, making the score 7-5. The IronPigs picked up a run off reliever DJ Baxendale in the eighth inning, and the Red Wings countered with a run of their own in the bottom of the eighth. Rooker's run-scoring groundout brought Wade in to make the score 8-6. Lehigh Valley scored five more runs in the top of the ninth to make the score 13-6. Four unearned runs were charged to Baxendale during the inning, and Mike Morin came on in relief giving up no runs or hits. Raley finished 3-for-4 on the night with three RBI. Lehigh Valley out-hit the Wings 16-9. NOTES: Local party band Me and the Boyz entertained fans before the game. The band was joined by WWE Hall of Famer, Wings fan, and Zweigle's connoisseur Mick Foley, a surprise guest of the Wings at the home opener...Foley signed autographs for an inning and donated all proceeds to the local chapter of Autism Speaks, partnering with the Wings on our Autism Awareness Day this Saturday...95-year-old veteran "Harmonica Pete" DuPre' performed the National Anthem..Alayna Berrythrew out the first pitch. The Spencerport native was the inspiration for the first ever softball player to be featured on a pack of Big League Chew. 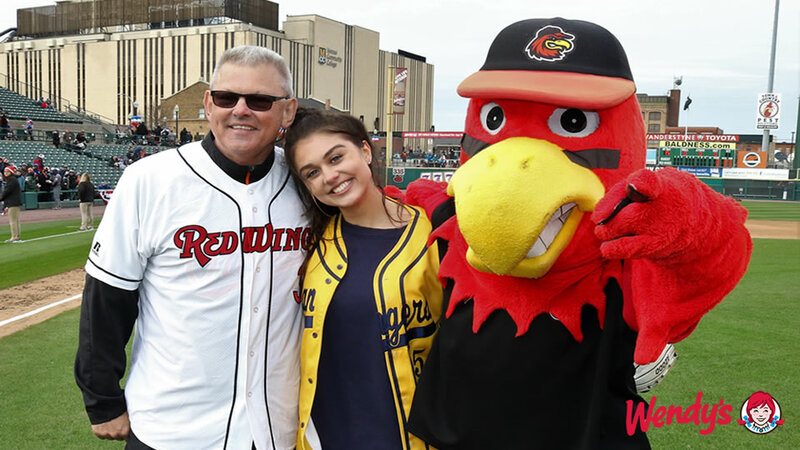 Alayna's grandfather, Red Wings Hall of Famer Bob Bonner, caught her first pitch.